Going to the dentist can be pretty stressful for some people, especially if they don’t practice proper oral hygiene. But what happens if a routine visit can actually leave you more prone to a life-threatening disease? Unfortunately, an increasing amount of research is showing that getting a root canal can lead to bacterial overload and may increase your chances of developing breast cancer. More than 25 million root canals are performed every year in the United States. 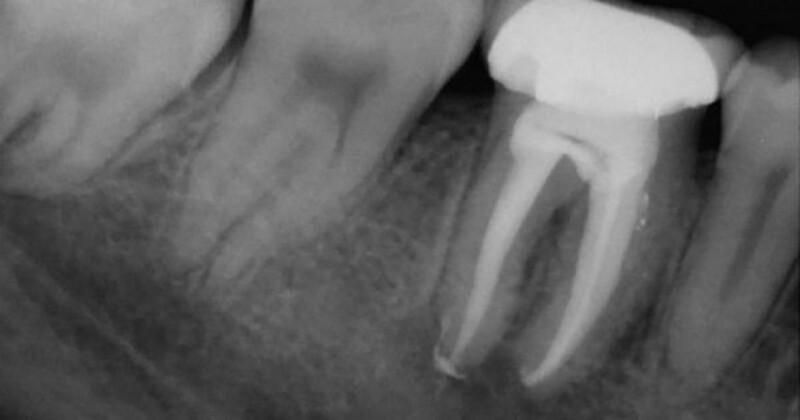 This highly invasive procedure involves drilling into a decaying tooth to remove the infected pulp, and then using a file of sorts to reach into the canal of the tooth to remove the remaining pulp. The canals are then filled with a plastic material (gutta percha) that’s quite problematic: Recent research shows that in many cases the plastic does not actually get into the tiny lateral canals of the tooth that branch off the main canal, which results in “leakage” of the highly toxic anaerobic bacteria the procedure was designed to remove. It is this bacteria that researchers claim results in disease (sometimes even decades later), including breast cancer. Dr. Kulacz, a well-known dentist and author of The Toxic Tooth: How a Root Canal Could Be Making You Sick, has performed biopsies on every root canal tooth he has ever extracted. And as a result, he says, “Almost all of them have remnants of necrotic debris still in that canal meaning that they were not thoroughly cleaned. Microbiological cultures of the surrounding bone showed infection almost 100 percent of the time.”(1). 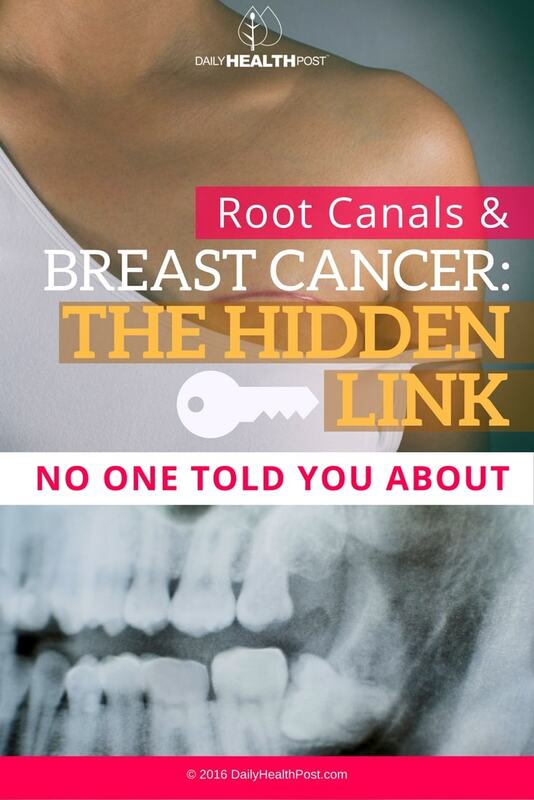 Bill Henderson, author of Cure Your Cancer and radio host of How to Live Cancer-Free, also states there is growing scientific evidence of a significant correlation between root canals and breast cancer. Henderson, who has been a cancer-prevention advocate for over 25 years says: “Two facts have jumped out at me…The most common cause of all cancers is root canal-filled teeth and cavitation sites; and until a cancer patient gets rid of the root canal-filled teeth and cavitations, they don’t get well.”(2). Others agree: In fact, a five-year study conducted by Dr. Robert Jones, that specifically looked at the relationship between root canals and breast cancer, revealing that a whopping 93% of breast cancer patients also had root canals, and the other 7% had other oral diseases or issues. Even more convincing is the fact that almost all of the cancerous tumors were found on the exact same side of the body as the original root canal (3). Another significant study published in 1998 in the American Academy of Periodontology essentially concluded that the root canal procedure itself may be the cause of infection. In 12 of the 26 case subjects the study examined, the root canaled teeth as well as the patient’s blood samples both contained anaerobic bacteria (4). Essentially, having a root canal done could lead to never-ending river of bacteria flowing into your bloodstream. We don’t often think of the health of our teeth as a reflection on our general health but some researchers now claim your teeth are not only living organisms connected to the rest of your body, but that they are actually part of the ‘acupuncture meridian system’—an ‘energy highway’ that runs through your entire body. Chinese Medicine believes that Qi (chi) energy flows through this highway and accesses all the different parts of your body (5). As such, a tooth that is diseased or dying should just be pulled, says Henderson, comparing it to trying to save an infected gallbladder or appendix by filling it with toxic chemicals as dentists do with your teeth during a root canal. Since each tooth has over 3 miles of tubules—tiny fluid-filled holes in its dentin layer—it is inevitable that the remaining tooth will eventually become a receptacle for deadly bacteria such as E. Faecalis, which is what is responsible for abscesses (pus-filled cavities) that ultimately spread to the rest of your body. In a best case scenario, with a strong, healthy individual, the constant influx of harmful bacteria can adversely affect your immune system, leaving you run down and at risk for illness. For those with compromised immune systems, this added bacterial assault can wreak havoc on their bodies, even leading to sepsis and death in severe cases (6). As Chinese Medicine claims, the body, including your organs, are all interconnected through meridians (energy highways). As such, an infected tooth, for instance, can then affect the organs connected to it through the associated meridians. According to Dr. Veronique Desaulniers, best-selling author and founder of BreastCancerConqueror.com, the 4th and 5th tooth (to the left and right of the center teeth) in the upper and lower jaw, for example, are connected to the breast meridian. Thus, “…constant infection caused by a root canal in these teeth can lead to complications, energy (or Chi) imbalances and blockages in energy flow in the breast meridian.” She further states this “imbalance” can even be visible, in many cases, on thermography scans. Dr. Thomas Rau, a Swiss doctor, also revealed that of the last 150 breast cancer patients treated in his clinic, “147 (98%) had one or more root canal teeth on the same meridian as the original breast cancer tumour.” He now goes so far as to recommend any cancer patient he treats to first see a biological dentist to examine their teeth and even remove all root canal teeth (7). What is probably the most disturbing fact about the connection between cancer and root canals is that this deadly association was first reported in 1925, when Dr. Weston Price and 60 other prominent researchers revealed 1,174 pages of research to the American Dental Association (ADA) clearly stating that essentially, there is no safe way to complete a root canal filling as every case ended in similar results—infection and disease elsewhere in the body. Dr. Hal Huggins, a dentist and dental toxin specialist says “Dr. Weston Price and Mayo Clinic’s [studies from] 1910 to 1920 described finding bacterial growth in root canals that could be transferred into animals and create the same diseases the donor human had in from 80 to 100% of the animals. Heart disease, in particular, could be transferred 100% of the time. His research has since been suppressed by the various Dental Associations in the United States.”(8). According to The Independent Cancer Research Foundation, the Weston Price’s work and other similar studies have all been “suppressed” by the ADA and the American Association of Endodontists (AAE) (9). These specialized dentists take into consideration the fact that there is a proven connection between root canals and disease. In fact, they openly state people should seriously consider their dental health with respect to many other types of diseases and suggest that anyone who is having health issues contact the Holistic Dental Association and/or the International Academy of Biological Dentistry and Medicine for not only more information but as well to locate a qualified biological dentist in your area.